Magic Carpets: Skinner December 9 auction of fine oriental rugs and weavings offers rich variety | Skinner Inc.
MARLBOROUGH, MA – November 26, 2018 – Skinner’s upcoming auction features the second part of the renowned Ronnie Newman Collection of Early Oriental Rugs. Also offered will be over 150 rugs of widely varied ages, sizes and origins consigned by other collectors. Pieces from the Newman collection were the highlights of Skinner’s October Fine Oriental Rugs & Carpets auction, where rare 17th and 18th century rugs and mats attracted vigorous bidding, and achieved excellent results. Collectors and connoisseurs will again have, in this auction, a not-to-be-missed opportunity to acquire the best of the best. Newman’s pieces are notable for their beauty, rarity, and status as works of art. In five decades of deeply informed collecting, he focused on four broad collecting areas: early Chinese rugs, primarily made in western China for use in Tibetan monasteries; flatweaves and embroideries from northwestern Persia; early Turkoman carpets and other textiles; and early Anatolian rugs and kilims. In addition to their beauty and rarity, many of Newman’s pieces are distinguished by their small size: bags, bag faces, and mats that have an intimate presence and invite prolonged, close-up appreciation. Another important characteristic of many of the textiles being offered is their age. Lawrence Kearney, Skinner’s Director of Fine Oriental Rugs & Carpets, notes that there is a dearth of really old material in the marketplace. The many very early pieces in the Newman collection are an important contribution to that collecting niche. As an example, one of the highlights of the second half of the Ronnie Newman Collection of rare and beautiful early rugs is a fragment of a 16th century Sharkishla rug (Lot 71, Estimate $5,000-6,000). Ronnie made many memorable observations about the textiles he loved so passionately and studied so deeply. One example: his statement that there are only three things one needs to know about rugs: color; color; color. This 500 year-old rug embodies that principle. The colors are clear and bright, powerful yet subtle. Another aspect of the rug’s hypnotic power is the figure-ground “conversation” that seems to be happening. Looked at one way, the rug has a golden yellow field with red medallions, but tilt your head slightly, and it is a red field rug with a broad yellow lattice. And on that lattice (or field) are facing pairs of archaic beasts on either side of an equally archaic tree, an ancient design going back thousands of years. 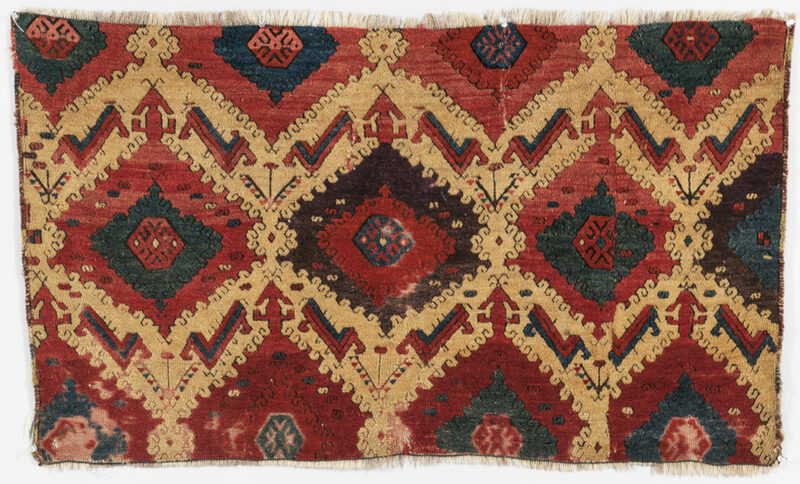 In addition to this piece, and other early Anatolian wonders, the Newman Collection boasts a number of striking Northwest Persian weavings, such as a mid-nineteenth century Shahsevan Soumak Verneh (Lot 74, Estimate $1,000-1,500). 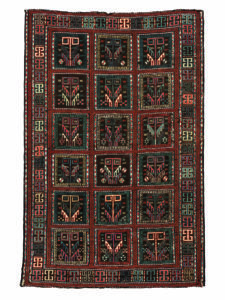 Also noteworthy is a selection of 18th and early 19th Turkoman Main Carpets, such as Lot 131 (Estimate $2,000-3,000) and Lot 132 (Estimate $3,000-4,000), and numerous bag-faces. 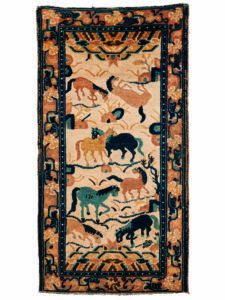 But of all Ronnie’s rug-collecting passions, it is early Chinese rugs that most engage him, with their combination of subtle coloration, ancient iconography, sumptuous materials, and often, as in this early 19th century Ningsha Rug (Lot 155, Estimate $1,500-2,000), a touch of whimsy. Skinner is pleased and honored to offer bidders the rare opportunity to acquire the fruits of a legendary collector’ taste and expertise. The December 9 auction promises to be a memorable occasion. Previews for the auction will be held in the Marlborough gallery, 274 Cedar Hill Street, on Friday, December 7, 12PM-7PM; Saturday, December 8, 12PM-5PM; and Sunday, December 9, 9AM-12PM. Free and open to the public, specialists will be on hand to answer questions. Auction lots may be viewed at https://www.skinnerinc.com. Skinner attracts top consignments and commands record-breaking prices in the international auction marketplace. With renowned expertise and extraordinary service, Skinner is the place for buyers, sellers and the passionately curious. Skinner appraisers are familiar faces on PBS’s 15-time Emmy Award-nominated ANTIQUES ROADSHOW. Visit us in Boston, Marlborough, New York or Miami, or online at www.skinnerinc.com. This entry was posted in News and tagged anatolia, antique carpets, antique rugs, carpets, carpets auction, Chinese rugs, embroidered textiles, oriental carpets, oriental rugs, persian carpet, persian rugs, Ronnie Newman, rugs and carpets, rugs auction, Tibetan art, Turkoman, weaving by Kerry Shrives. Bookmark the permalink.